Her past is a secret -even to her. TV reporter Laura Nilsson, known as the ?Baghdad Babe,” spent eighteen months in an Al-Qaeda compound after being kidnapped live on the air. Two years later, she's still wondering why. 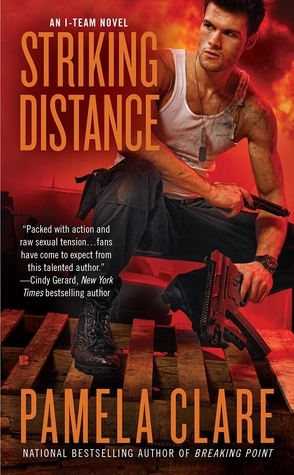 No mission in Javier Corbray's fourteen years as a Navy SEAL affected him the way Laura's rescue did. No woman had stirred his protective instincts the way she did. And he wants her more than he's ever wanted anyone. As Laura and Javier's passion ignites, so does Laura's need to discover the mystery of her past. Especially when she learns that her abduction was not random and that she's still a target for a killer with an impenetrable motive. Now Javier will have to rely on his skills to keep the woman he loves from being struck down before she dares uncover the truth. I bought this book. The opinion expressed is my own. So, I have loved every single book in this series. Every book has it’s own plot and every HEA comes after a long and traumatic tale. If you haven’t read Pamela Clare before you should be warned that her stories often feature the worst kind of criminal and the most horrific of crime. This one is particularly horrific and I do warn you that it often left me in tears. This author pulls no punches, not ignoring the harsh realities and tough decisions because of the genre her book is marketed at. This is going to be a short(er) review than usual as I don’t want to give much away. When we meet Laura, she is hours away from being rescued. Although we do not witness her ordeal (the beatings, the daily rapes and the constant threats of beheading) we see the aftermath and it is not pretty. Once rescued, she has obvious signs of PTSD, is struggling with company and has to deal with the public interest in her case. Honestly, I was horrified for her before she was released and I was absolutely appalled at the grief she had to deal with after she was freed. A few years pass (there is quite a bit of time jumping in this book as a whole) and she has to deal with the trial and her “secret”. She also has to deal with the reemergence of an old flame in Javier and the rekindling of their romance whilst he tries to protect her … it is ridiculously intense. As Javier battles to save Laura whilst she is targeted by assassin’s unknown after her captor sets his followers after her, it becomes apparent that his feelings run deeper for her than purely professional. Both are damaged and carry deep emotional scars… will it all work out in the end? I loved both of theses characters, the strength of them apparent as we watch them face trial after trial. I kept hoping they would get a break but the punches kept rolling and my tears kept on falling. This is not an easy read; it will put you through the ringer and things may not work out as perfectly as you imagined (they bloody didn’t for me) but I was hooked by every word. This is not a perfect world, and these are not perfect characters, but this is a book of people finding the best in a horrific situation. Javi was as emotionally damaged as Laura in a way and the sacrifices that he made for her were beautiful, topped only by the sacrifices that Laura makes herself (blubbing on a bus readers, blubbing on a bus!). I wanted so badly for it all to magically OK for them … it wasn’t going to be that easy though. Over the back drop of horror was a beautiful love story with a determined man trying to show a emotionally battered woman how to accept love again and I fell in lust with him over and over again; I honestly can no longer pick a favorite heroin this series.